The Korean War (June 25, 1950 – July 27, 1953) was a war between South Korea and North Korea, in which a United Nations force led by the United States of America fought for the South, and the People’s Republic of China with the support and assistance of the Soviet Union fought for the North. The war resulted from the arbitrary division of the Korean peninsula into two Koreas at the end of World War II, and from the global tensions of the Cold War that developed immediately afterwards. Korea was ruled by Japan from 1910 until the closing days of World War II. In August, 1945 the Soviet Union declared war on Japan and, by agreement with the United States, occupied Korea north of the 38th Parallel. U.S. forces subsequently occupied the south. By 1948, two separate governments had been set up. Both claimed to be the legitimate government of Korea, and neither accepted the border as permanent. The conflict escalated into open warfare when North Korean forces, supported by the Soviet Union and China, invaded South Korea on June 25, 1950. On that day, the United Nations Security Council recognized this North Korean act as invasion, and called for an immediate ceasefire. On June 27, the Security Council adopted S/RES/83: Complaint of Aggression upon the Republic of Korea, and decided to authorize and dispatch a multinational U.N. force to Korea. In the first two months of the conflict, U.N. and South Korean forces, outnumbered, outgunned, and suffering heavy casualties, were forced back to a relatively small area on the southeast corner of the Korean peninsula that became known as the Pusan Perimeter. The U.N. and South Korean forces had their backs to the sea, and the situation was grim. On September 15, 1950, U.N. Forces Commander General Douglas MacArthur ordered U.S. Marines to spearhead an amphibious assault landing at Inchon on the west coast of the peninsula, behind the North Korean lines. The successful counter-offensive quickly led to the liberation of the capital city of Seoul, allowed the beleaguered U.N. forces to break out of the Pusan Perimeter, and cut off many of the North Korean invaders. Those North Korean troops who escaped envelopment and capture or death were forced to retreat back north, all the way to the Yalu River at the Korea-China border, or into the mountainous interior. It appeared that the war would end soon, with a resounding victory for South Korea and the U.N. forces. But appearances were deceiving. By late October, the harsh northern winter had set in, with temperatures well below zero. 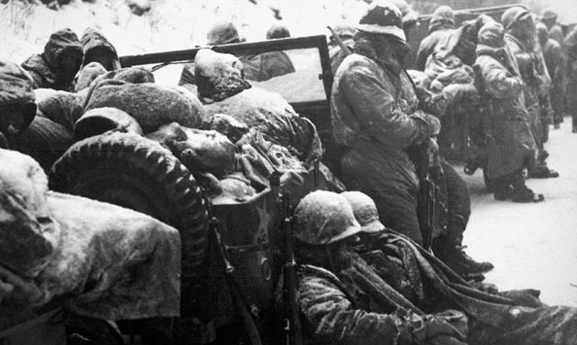 Undetected for the most part by the U.N. Command, hundreds of thousands of Chinese troops had poured across the frozen Yalu River in support of North Korea, and suddenly launched a massive attack at many points along the U.N. front. This marked another reversal of fortune for the once-again vastly outnumbered U.N. forces. The numerically superior Chinese rapidly pushed the United Nations forces back into South Korea, and the last two years of the war settled into stalemate interspersed with bloody attrition warfare. The fighting ended on July 27, 1953, when an armistice was signed. The agreement established a new border between the Koreas close to the previous one along the 38th Parallel, and created the Korean Demilitarized Zone (DMZ), a 2.5-mile-wide fortified buffer zone. No formal peace treaty has ever been signed, and bellicose border incidents have continued up to the present day. The war has been seen both as a civil war and as a proxy conflict in the Cold War between the United States and the Soviet Union. While not directly committing forces to the conflict, the Soviet Union provided strategic planning, weapons, and material aid to both the North Korean and Chinese armies. 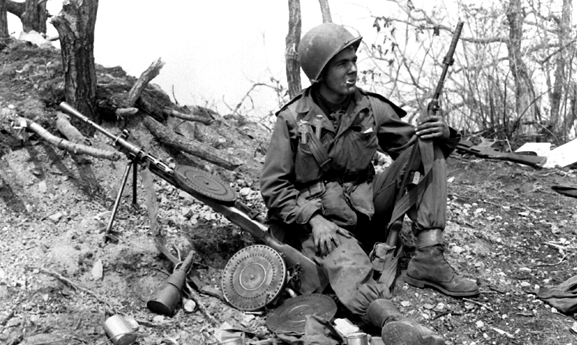 From a military science perspective, the Korean War was initially fought using the mobile operations and tactics of World War II. After the first year, however, the conflict settled down into a holding operation while an armistice was argued over; and the static tactics of World War I trench warfare became the norm for the last two years of the conflict. The war also saw the first combat between jet aircraft, such as the U.S.-built F-86 Sabre used by the U.N., and the Soviet-built MiG-15 used by the Chinese and North Koreans. The death toll from the Korean War is appallingly high. The number of U.S. military deaths shown below is the official Pentagon figure, recently corrected and revised. There is no consensus on the other figures. The principal statistical sources all seem confident of the accuracy of their numbers, but they all provide drastically different numbers. Each of the figures other than those of the U.S., therefore, is an estimate, a median taken from several sources. These include the Republic of Korea Defense Ministry, the Encyclopedia Britannica, the Encyclopedia Americana, the Dictionary of 20th Century World History, Wikipedia, and other sources. Joseph Stalin once infamously commented that the death of one person is a tragedy, but the death of one million is a statistic. However, every one of these estimated 2,661,499 deaths was once a life, and is a tragedy. In the years since the war, the South has become the democratic and prosperous Republic of Korea, and is now one of the United States’ closest allies and trading partners, while the North is now one of the few surviving Communist dictatorships, and one of the most repressive and isolated regimes in the world. And the old tensions, unfortunately, are still with us today.